Those were the words President George H.W. Bush spoke as he signed the Americans with Disabilities Act (ADA) in 1990 - the landmark legislation ensuring the fundamental civil rights of all persons with disabilities. Today, those words and the law have now suffered a major setback. Congress has passed HR 620 which severely weakens Title III of the ADA by removing any incentive for businesses, organizations, and anyone who provides services to the general public to make their services accessible. “Inglis joined the millions of disabled citizens and all of the civil rights advocacy organizations in urging Congress to vote ‘NO’ on this legislation,” said Dyann M. Roth, Inglis President & CEO. “It now puts the weight of enforcing fundamental rights protected by the ADA on the shoulders of people with disabilities - which is simply wrong from both humanistic and economic perspectives,” Roth continued. 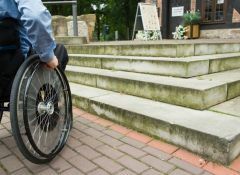 “If they pass this bill, they are only increasing the barriers people with disabilities have to face every day,” said Michelle Pfeffer, a wheelchair user and Inglis Resident Services Coordinator at Pennypack Crossing. “We should be increasing involvement instead of making people with disabilities feel less a citizen and remove access to every part of life,” said Pfeffer. “One would think,” says member of Inglis' Board of Directors, Won Shin, “that after almost 28 years since the ADA was signed, people with disabilities would be fully participating in society through work, education, social engagement, etc. However, the reality is that people with disabilities still have to fight for their civil rights every day clinging on to the hope and protection the ADA provides,” Shin continued. HR 620 removes the civil rights of all citizens with disabilities; it causes people with disabilities to wait for their right to access any service that all citizens have access to immediately. “To think that the Congress considered and now passed legislation that once again, slams the door on the hopes of people with disabilities - reducing them/us to second class citizens is reprehensible and beyond comprehension,” said Shin.